Looking for a Sunday afternoon adventure? 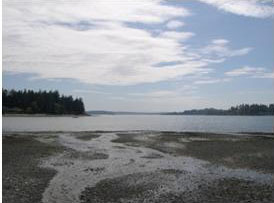 Come explore the Schel-Chelb Estuary in the Pleasant Beach Watershed on Sunday, September 14, from 2-4pm with volunteers from the Bainbridge Island Watershed Council. 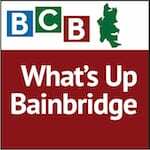 In this episode, Bainbridge Island Watershed Council chair Deb Rudnick talks with BCB host Diane Landry about the Council’s plans for the Sunday walk. You might ask, what is a watershed? All water runs downhill and eventually ends up in some body of water. The area of land that sheds water all to the same place is called a watershed. For example, the whole west coast of the United States lies in the Pacific Ocean Watershed. 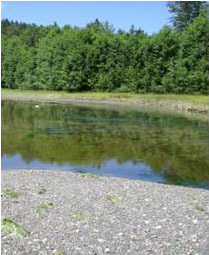 The Schel-Chelb Estuary is a pool of fresh and saltwater in the Pleasant Beach Watershed, and is located approximately 100 meters west of Lynwood Center on Point White Drive. This man-made sanctuary was created in 1997 as a mitigation project to compensate for tidal wetland filling at the Wyckoff Superfund site. 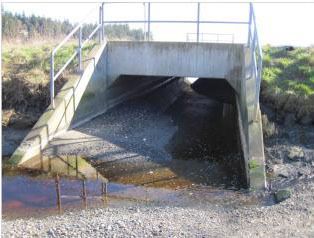 Habitat restoration included installing a bottomless box culvert under the road to improve tidal connectivity and salmon passage. In 2003, the Open Space Commission purchased the land to the east and established the Camas East Loop trail. As with last year’s walk, which featured the Murden Cove Watershed and drew 30 curious visitors, this year’s one-mile route will highlight beach and stream aquatic life, invasive and native plants, rain gardens and stormwater runoff, and estuary functions. Volunteer guides from various science fields will be posted at different stations along the route. Show up at the Sunday Lynwood Farmers’ Market lot any time between 2 and 4 pm, and complete the walk within that timeframe. Participants are encouraged to bike down, but parking is available in the Lynwood Center lots or on the street. Visit www.biwatershedcouncil.org for more information. Credits: BCB host: Diane Landry; BCB studio tech: Joanna Pyle; audio editor: Tim Bird; “What’s Up” music splash: Tim Bird; BCB ferry music: Dogfish Bay Studios; Podcast art: artopia creative.